That’s right, I now have ARC’s (Advance Reviewer Copies) and book marks for Plastic Polly! And, because Halloween is Polly’s favorite holiday, I’ve decided to giveaway an ARC and some book marks to celebrate! Halloween is my favorite holiday. Not because of the candy, or because I like spiders and blood and guts and stuff. (Gross!) Nope, I like Halloween because it’s the one night in the year when I can pretend to be anyone I want and no one can call me fake. To enter the giveaway: Leave a comment below with your best guess at Polly’s Halloween costume. In the event that no one guesses correctly, I’ll select a winner via a Random Number Generator. If more than one person picks the correct costume, I’ll select one of them via a Random Number Generator (sorry, ARC’s are limited). But wait folks, there’s more! 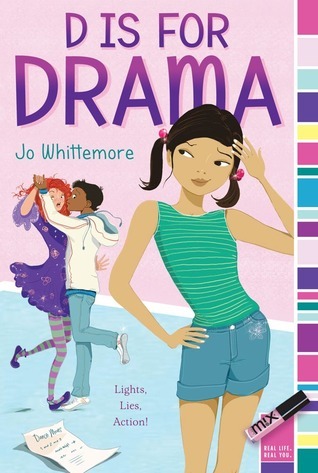 The winner will also receive a copy of D is For Drama by Jo Whittemore, my pub sister. So to recap: Leave a comment below with your best guess at Polly’s Halloween costume this year. The contest runs from today and ends on Friday, October 19 at midnight. I’ll announce the winner on Saturday, October 20. Got that? Okay… On your mark, get set…GO! This entry was posted in Giveaway, Plastic Polly and tagged 2013 Middle Grade Book, 2013 Middle Grade Novel, Advance Review Copy, ARC, Book Giveaway, Halloween Costume, Halloween Giveaway, Jenny Lundquist, middle school, Middle-Grade Novel, Plastic Polly, Plastic Polly Book. Bookmark the permalink. 13 Responses to Plastic Polly Halloween Giveaway! Looks like a book my big girl would love! Maybe she’s a Barbie this year? Thank you! This looks like a great book and I love the cheery cover. How fun to see your name in print, Jenny. I think Polly dressed up as a mom! Just got caught up on your blog on a slow work day. The sad part is that I have read your book and I don’t remember what she was for Halloween. My short term memory is awful! I think she dresses up as Secretary of State. Or better yet, the first female U.S. President! This sounds like a great book for middle graders. I love the cover, too! My guess is that Polly dresses up like college student – a girl who is (at least to Polly) mature and in control. Thanks for the giveaway! I think that Plastic Polly is going to be a teacher for Halloween! I hope I win, Seeing Cinderella is my favorite book & I own nearly 500 books! YOur book even beat out The Trumpet of the Swan, which used to be my favorite! I can’t wait for your next book, March is too far away! I am so excited that I have an almost 11 year old daughter that gets to read your books! Think I am going to read them too!! !